Buying a property is a big investment. And as a first-time home buyer, you have much to consider: getting pre-approved for a bank loan, deciding what type of property fits your lifestyle, figuring out where you want to live, finding a qualified agent, and then navigating all the steps from the initial offer to the closing. If you’re like most first-time buyers, you’ve probably done some research and brushed up on a lot of this. While that’s a great start, it’s important to dive a little deeper. For instance, beyond the list price, have you considered all the costs associated with buying a home? In this article, we’ll break down those numbers and also share a few key strategies that could help you avoid major pitfalls and streamline the buying process. 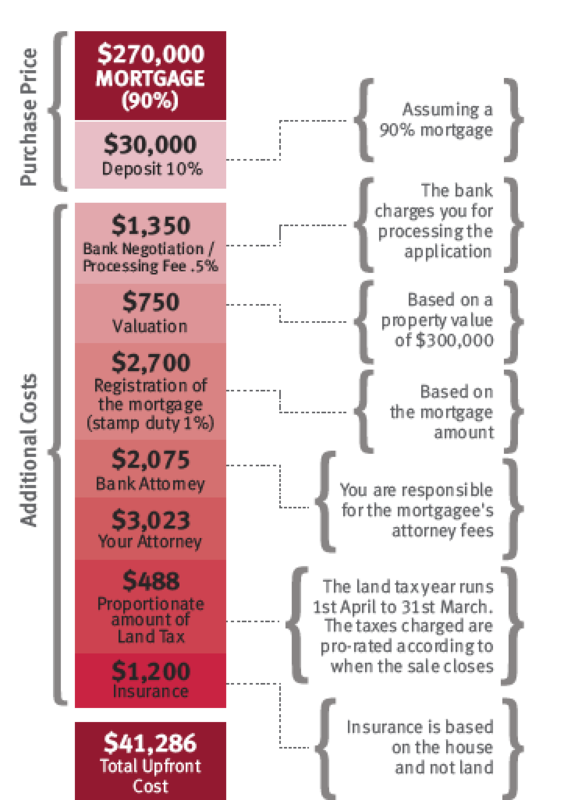 So the bank tells you that you are preapproved for a home loan with a purchase value of $300,000. Upon a second visit to a home, you are sold; it just feels right. It’s listed at $325,000, but with a great agent by your side, you’ve been able to negotiate the price down to match your budget. It’s a done deal—offer accepted! Congratulations, you’ve begun the process of buying a home at $300,000. So now, what will it really cost you? Along with your 10% deposit, you will also need to have an additional $11,286. Refer to chart for breakdown. On top of those costs, there are other factors that could impact the bottom line. Below are three key strategies that every first-time buyer should consider when they are looking at property. Know what’s below – Before buying land, it’s wise to find out what’s under the ground. That’s because the last thing you want to hit as you dig for your home’s foundation is rock 10-feet under. To avoid this, consider having test holes done as a condition of the sale. There are many trusted providers that can do the testing and submit a comprehensive report, so you know exactly what you are buying. .The cost of this is site specific so some providers offer free site visits to give you a quotation. Get an inspection – Making your offer subject to an inspection is critical, especially if you’re considering an older home. When you hire a house inspector or structural engineer, they’ll do a full assessment of the property, checking the condition of items such as electrical, roofing, flooring, septic systems, and pointing out any possible structural issues. It’s a small price to pay to sleep well at night, or to get an understanding of necessary repairs. Define the lines – Remember, your agent is not a land surveyor. If you are interested in accurately defining a property’s lines, consider asking your agent if the owner would consider showing the line marks before the deposit is paid as this is usually done before closing. That way, you’ll know exactly where your property starts and ends. In certain cases, an owner may be open to showing the line marks before you pay the deposit. Simply ask your agent about this if the property is difficult to define. Buying a home for the first time can seem overwhelming. That’s why it’s important to work with an agent who can guide you through every step of buying a home. This should include giving you these little extra nuggets of information that not only help you find the perfect home, but also ensure you made a wise long-term investment.